In 2009, Charles Adler joined with friends Perry Chen and Yancey Stricker to found Kickstarter, the groundbreaking online platform where individuals and teams can crowd fund creative projects. Since 2009 Kickstarter has facilitated almost $US900 million in pledges from 5.2 million people, funding over 50,000 projects and inspiring similar platforms like Australia’s Pozible. After recently leaving the company, Adler reflects on circumventing the barriers to achieve creative independence. Illustration of Charles Adler by Alessandro Apai. We are now in an age where creativity has the power to become our economy, and arguably it already has. What’s interesting to me is this moment, where we are just at the beginning of this shift. 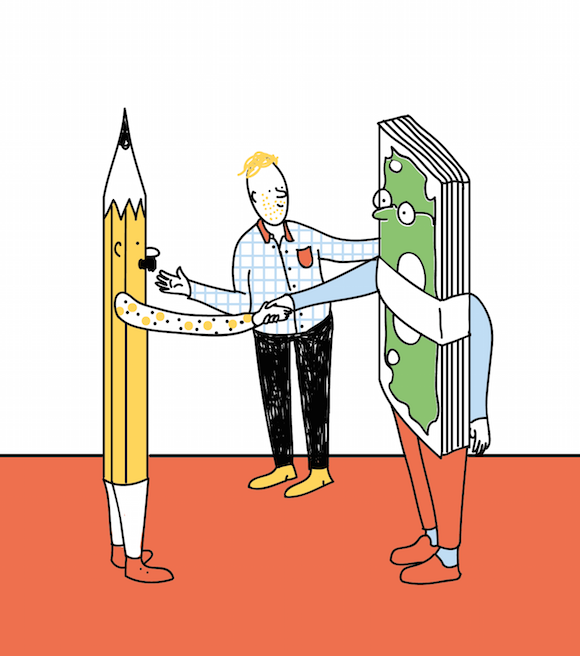 Kickstarter is about creativity and, more broadly speaking, it’s about moving beyond creativity itself towards an idea of ‘creative independence’. I’m interested in empowering the creatives, in the dialogue between independent ideas and corporations, and how they play equitably in the same box, dissolving the power structures. From an entrepreneurial perspective it’s important to ask, ‘how do these companies or services we create exist in and improve the world, as well as provide us with economic stability?’ The internet is disrupting constantly. Uber and Airbnb are good examples of companies challenging governments and the incumbents (the taxi driver or the hotel). These challenges to the status quo are going to be very tense, [but] it’s these conversations and the results of these conversations that move us forward. Whether you are an individual or a team, you now have the ability to have an idea, transact that idea, put it into the world and get recognition for it – whether it be a piece of software, a piece of hardware, or even a garden, a work of art or music. [This control] creates a deeper sense of pride and power, giving us the ability to create our very own little micro economy around a product. The Kickstarter model means the creator is always responsible for the success of their project. So there’s this future that we’re going to be talking about and that everyone is effectively and collectively responsible for, and has the power to change. Kickstarter was born from an attitude we developed in response to the idea of the industrialisation of creativity in any category. Large companies have, in a way, encouraged industries to start homogenising everything – from films to houses – and this has sort of resulted in a loss of our international cultures. It’s hard to find the difference between say Hong Kong and Chicago or Sydney. We start losing a bit of this individuality. We three founders [of Kickstarter] were dismayed by this. Less so because of this abstract thought about the economy and creativity, but more because we were looking at friends around us – poets, writers, filmmakers, musicians, product designers – who have brilliant ideas and cannot bring these ideas to market because there are these barriers in place called ‘economics’. Much of what we were trying to do was break these barriers down or, as I like to call it, ‘circumvent the barriers’. We were trying to address this issue we kept running up against day-in and day-out within this particular barrier: the gatekeeper – the gatekeeper being manufacturing. Ultimately we became the Kickstarter you now know, which is about the attitudes empowering individuals to put their ideas out in the world and to envision a future that is far more democratic and far more inspiring by enabling those individuals to aspire to greatness in a more vibrant community. 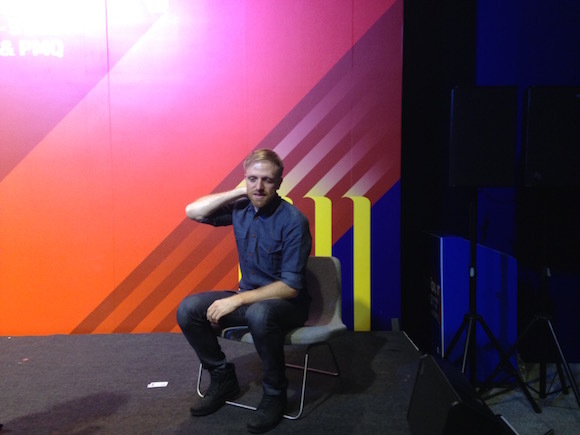 Charles Adler at the Business of Design Week (BODW), December 2015.
desktop spoke to Charles Adler in Hong Kong at the annual Business of Design Week (BODW) in December. Business of Design Week is the flagship event organised by Hong Kong Design Centre since 2002. 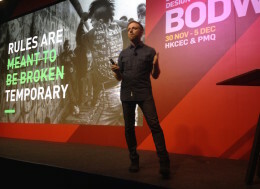 Each year, BODW brings to Hong Kong some of the world’s most outstanding design masters and influential business figures to inspire the regional audience on creative thinking and design management. Today, BODW enjoys the reputation as Asia’s leading annual event on design, innovation and brands.